We used to have allotments in our village until the blight. That was not a gardening blight or a problem growing anything but a planners and local politicians blight. A large green open space surrounding an old hospital ‘High Royds’ was too good an opportunity for power broking and developers profits so the old hospital and the village allotments all had to go. I blame ‘careless of the community’. Now the ‘new’ village is built and called Chevin Park (not High Royds because the hospital was a former lunatic asylum. Other name changes such as Windscale to Sellafield also springs to mind.) Many properties are empty partly due to the property recession but also due to the paltry size of the gardens and lack of allotments that could so easily have been restored. What has replaced our allotments? As you can see a veritable forest of plastic tubes protecting newly planted trees and the flimsiest stakes you could imagine after 3 foot canes. 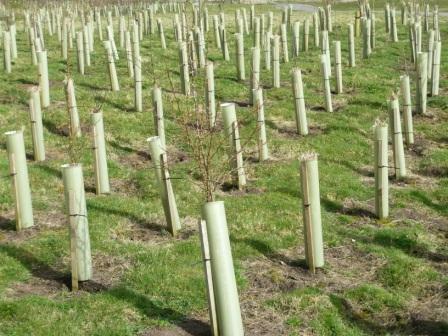 As I said earlier this week this is an updated post for National Tree Week 2018. The plastic tubes are now litter around some decent young trees. Dig a good sized hole and incorporate some slow release fertilizer like bone meal. The tree should be there for a long time. Spread the roots of a bare rooted tree or tweak the edges of a container grown tree to give roots the encouragement to spread. Trim off any broken roots. Plant at the same depth to which the tree has been grown. There is usually a soil mark on bare trees to help. Do not bury any graft. Drive the stake into the bottom of the planting hole before planting the tree and try to ensure that 2/3rds of the stake is underground when the soil is returned to the hole. The stake should reach no more than one third of the height of the tree. This anchors the roots while allowing the stem to sway and thicken. There should be a gap of 1-1.5in between the stem and the stake. If rabbits are a problem protect the tree with a plastic guard. Water the tree in and keep watering through dry spells until well established. 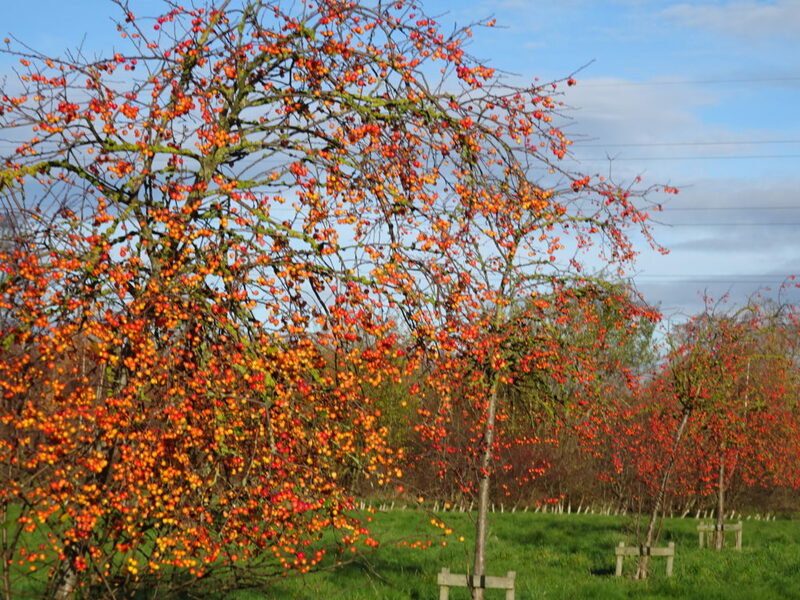 Wait – good trees take time to develop there full potential. Planting trees and flowers could help our environment and provide us with clean air to inhale. Also, trees absorbs great amount of water specially rain water and prevents flood to occur. These plants are really important for us and for our environment. But allotments cut down on food miles and can provide great organic food. 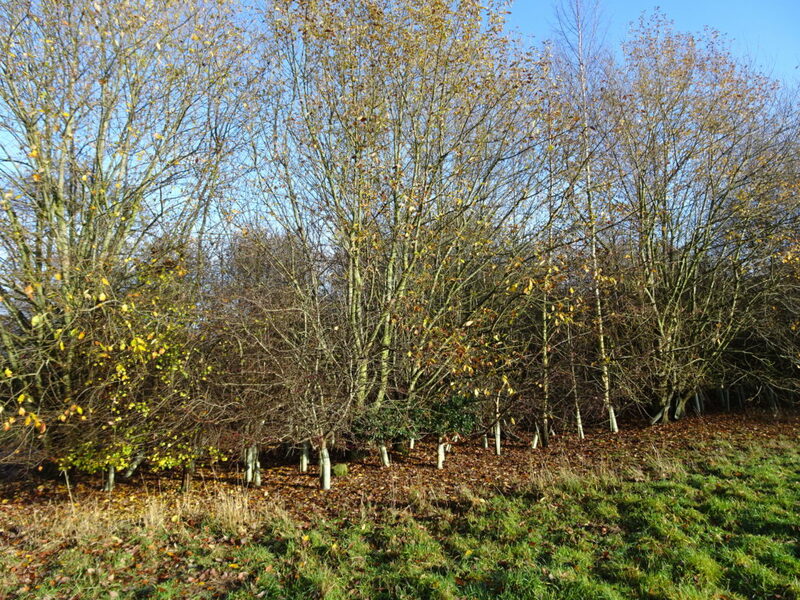 There is a place for trees but these are disguising 541 new homes!